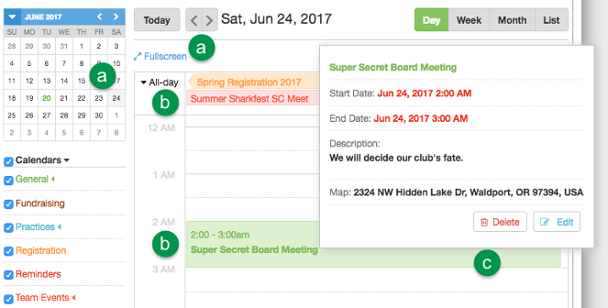 The SwimOffice calendar is your central hub to manage all the activities on your team. If you can use Google’s calendar, you can use ours. Let’s take a quick look at all the features. Click Calendar Notes to put whatever message you want at the top. It’s a great way to highlight what’s currently important. New Calendar Item lets you add these various event types which we will cover in the next few lessons. You can do the same thing by clicking the by the calendar types. When you click the by a day in List view, it adds a General event. Choose which calendars to see in Customize Filters, or simply select which ones on the left. Those with an arrow let you select additional filters. Use Saved Views to both save and pull up views you’ve defined, such as only practices and team events in the weekly view. Click Make Default if you always want to initially see that view each time you come to the calendar. Show and hide the mini calendar and calendar types with the red calendar icon. Click Print to first see a preview of what you’ll print that uses the current filter settings. Check Black and White if you don’t have a color printer, then click Print. Click Subscribe and then Copy Link for any of the calendars you want to subscribe to, then paste the link into any calendar program that uses ICS files, such as Google Calendar, Apple iCal or Microsoft Outlook. As noted at the top of the dialog, whatever filters are active for a given calendar will apply to the subscription. For example, if you are displaying Practices for the Juniper location only, then your subscription will only receive practices for the same location. Please ignore the Export button; we will be deleting it (because the Subscribe button fulfills this function) and replacing it with a Settings button. Looking for a certain event? Just type its name right here. You can view your calendars several different ways. Day shows just the events for one day. Click a day on the mini calendar to the left or the arrows to change which day displays. All-day events are at the top, and shorter events are in their scheduled slots. Hover over an event for more details. Some have action buttons to edit, register, and so on. Week and Month give a bigger picture, with the same controls as Day. List is the default view and gives a complete list of all events for a given period, which defaults to a month. 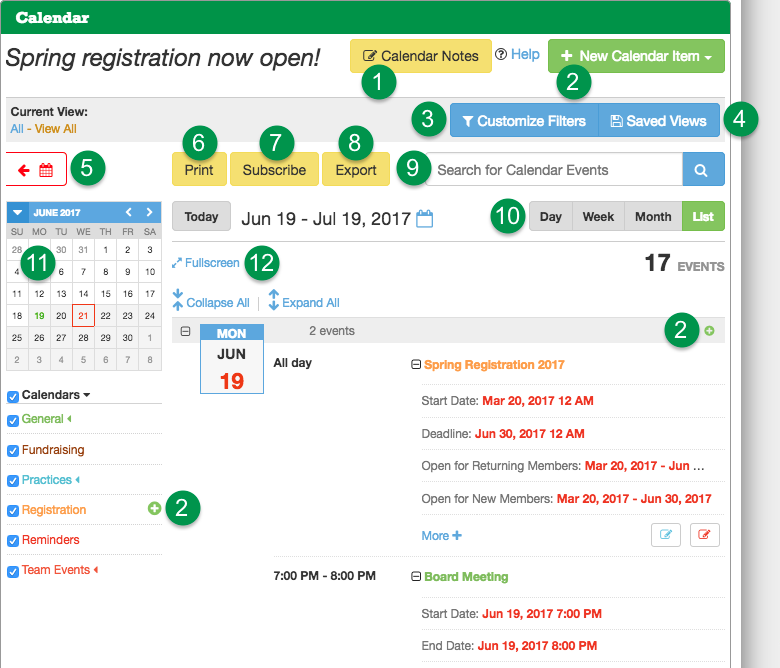 Click the calendar icon to change the date range of events displayed. The current day has all the events expanded. Click the on other days to expand them. Collapse All and Expand Allevents. More + opens a detailed view of the event. 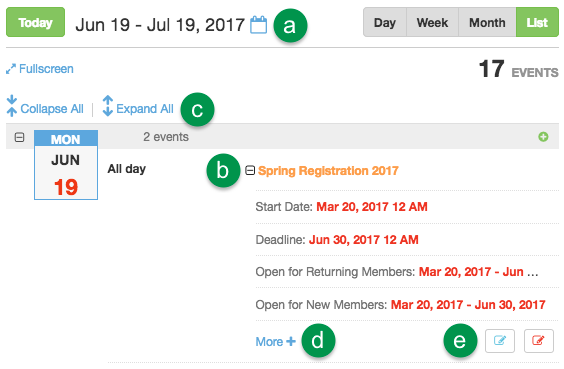 Some events have action buttons to edit, attend/decline, register, etc. Hover on an icon to see a tooltip for what the button does. 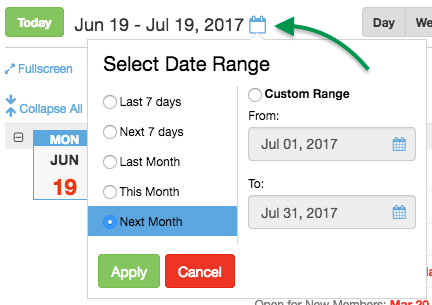 Click any day in the mini calendar to jump to that day/week/month in the main view. Note that changing the month with the arrows doesn't navigate to that month until you click a day within it. Fullscreen fills the screen with the calendar, and Collapseshows the surrounding website again. 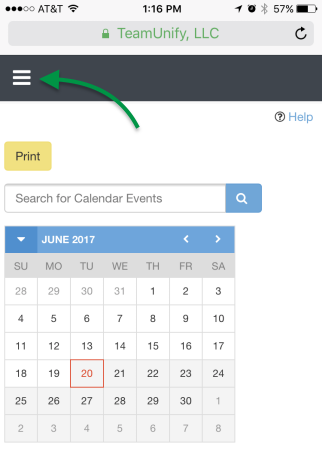 On tablets and smartphones, you have a fully responsive calendar that is always full screen. Tap the hamburger menu in the upper left to navigate elsewhere. We will go into detail about the various events in subsequent lessons. There are several ways to edit an event and do other things with one. We will cover them all here, rather than list them every time we say "click the event's Edit button." 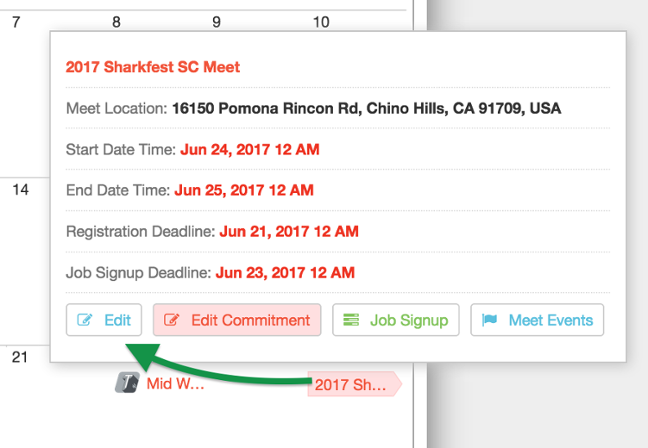 The same applies to the other event controls such as Edit Commitment and Job Signups. The controls available will depend on what kind of event it is. List view, collapsed event. Possible controls available: Edit, Register Online, Make a Donation. List view, expanded event. Possible controls available: Edit, Edit Commitment, Job Signups, Meet Events, Select Teams, Invited Teams, Delete, Make a Donation, Register Online. After clicking More + for an event in List view. Possible controls available: Edit, Edit Commitment, Job Signups, Meet Events, Make a Donation, Register Online, Delete. 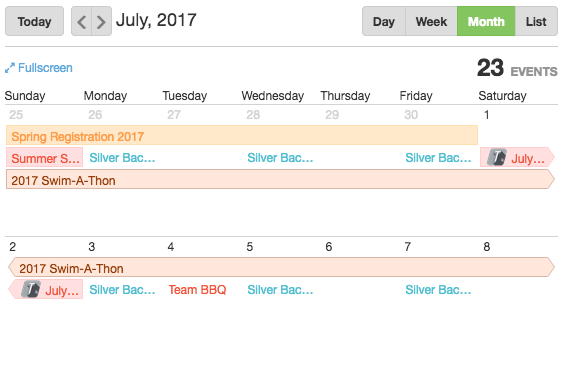 Hovering over event in Day/Week/Month view. Possible controls available: Edit, Edit Commitment, Job Signups, Meet Events, Select Teams, Invited Teams, Delete, Make a Donation, Register Online. Next we'll learn how to transition to the new calendar.